Opening Reception for Katie Shima: What time is it there? Home / Events & Performances / Opening Reception for Katie Shima: What time is it there? 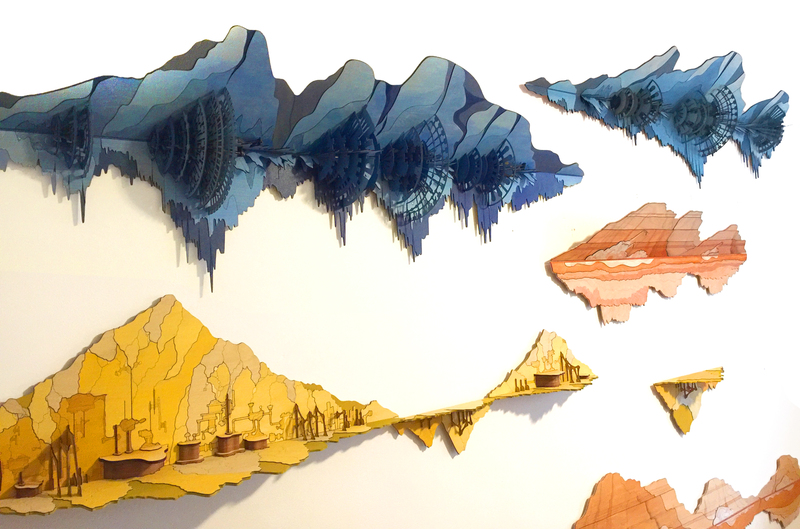 Katie Shima’s intricately constructed wall relief sculptures weave together digital and traditional techniques as a means to explore how societies shape their environments by building in, over, and through the landscape. Comprised of natural materials such as stained wood and fiber, the installation will appear as if an archipelago of disparate locales. Organic in overall appearance, the detail in each sculpture evokes a complex, self-perpetuating machine defined by its own patterns, logic, and dynamics. When viewed as a whole, the installation resembles a graph of events over time, converting each landscape into a timescape. Because the timescapes never make contact with each other, they emerge from and diminish into a single dimension, expunging any sense of collective place. By presenting these timescapes as parallel universes defined by their own tracks, Shima calls attention to the lack of mutual understanding between cultural groups and the deep polarization of the globe, despite the ease of communication that modern technology affords. While the separation between the worlds appears menacing in contrast to our increasingly globalized world, Shima offers a hope for the future. Walking down the Hallway, each viewer has a choice to continue alone along their path, or to reach out to other viewers and forge new paths together. Shima has exhibited at Knockdown Center, Trestle Gallery, Mighty Tanaka Gallery, and Devotion Gallery, all in Brooklyn; and Bridge Gallery, NY; the Lockwood Matthews Museum, Norwalk, CT; and the George Walter Vincent Art Museum, Springfield, MA. She has completed a residency at Clocktower Gallery, NY, and is a founding member of the electronic noise group Loud Objects. She earned her BA and her MA in Architecture from Columbia University, NY. Katie Shima is a 2017-18 recipient of the ArtFP, an open call for Brooklyn-based visual artists to exhibit at BRIC House. For more information, visit BRICartsmedia.org/ArtFP.